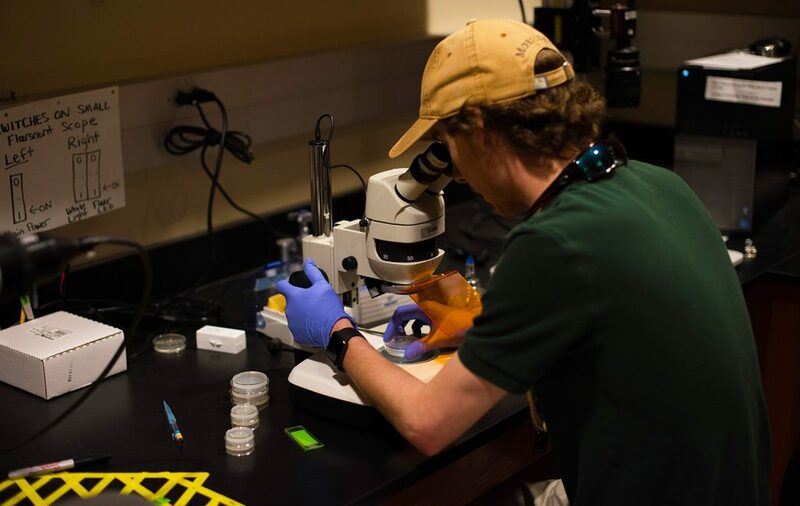 The Department of Biological Sciences – University Scholars Program is a closely integrated undergraduate and graduate program where qualified students begin graduate study in their senior year; such a program may lead to simultaneous or sequential completion of requirements for both Master’s and Bachelor’s degrees. The University Scholars Program is for highly motivated candidates for the B.S. Degree in Biology or B.S. in Microbiology Degree. Students are initially identified during the sophomore year (in some cases students might have junior or senior standing) and asked to consider the University Scholars Program. Criteria will include a GPA of 3.5 or higher and the faculty’s estimate of a student’s talents, motivation, and potential for graduate study. Students who are already engaged in research projects will be given special consideration. An undergraduate student is nominated by a faculty mentor. Admission is chiefly determined by the faculty’s estimate of a student’s talents, motivation, and potential for graduate study. Contingent upon completion of 61 semester hours of study, students are admitted to Phase I at the beginning of their junior year. During the junior year, students will take courses in their major field, as advised by their mentor, to prepare them for the work of Phase II. Admission to Phase II is facilitated by, but not dependent upon participation in Phase I. Students who are already engaged in research projects will be given special consideration. An undergraduate student is nominated by a faculty mentor and considered for acceptance into the program by both the Graduate Committee and Department Chair. Admission to Phase II requires submission of the graduate application to the Graduate School, completion of at least 90 undergraduate credits, a GPA of 3. 5 or higher, an acceptable GRE score, completion of a least three-quarters of the hours required for the major, completion of core curriculum requirements (except for the W requirement), and official departmental approval of the graduate application. During the senior year, the student will take graduate courses that will count toward both the bachelor’s and master’s degrees. Up to 15 credit hours can be counted towards the 36 hrs required for the undergraduate major. The student’s adviser must approve the graduate courses prior to enrollment in the courses. Following completion of 120 hours (or the minimum required by the college), the student will receive the undergraduate degree. Following receipt of the undergraduate degree, the student will continue taking graduate courses until requirements for the master’s degree are met. Students in the University Scholars Program are classified as undergraduates until they complete requirements for their undergraduate degrees and therefore may not hold graduate assistantships until their classifications are changed to graduate status. At that time, University Scholars will also become eligible for graduate fellowships and scholarships. Sophomore Year: Typical sophomore classes. Students will be identified for Phase I of University Scholars. Junior Year: At least three-quarters of the hours required for the major and minor, and completion of core curriculum requirements, except for W requirement, will occur by the end of the junior year. Students will engage in research and complete courses designed to prepare them for Phase II. Students will apply for Phase II and complete the graduate application at the end of junior year. Senior Year (after admission to Phase II and departmental approval of graduate application): Completion of required courses for BS degree. The student may take up to 15 credits of graduate courses, as approved by the advisor that will count toward both the bachelor’s and master’s degree. The limitation on the number of credits from one department applicable to the undergraduate degree does not apply to students in the University Scholars Program. The bachelor’s degree will be awarded after completion of 120 credits or the minimum required by the college. Master’s Degree (after completion of bachelor’s degree): Students take additional graduate courses to complete the master’s degree. The master’s degree will be awarded after all 30 credits are completed. D. How will the program meet all UA undergraduate and graduate requirements? All classes required in the current BS and MS programs will be required in the University Scholars program. The only change is to allow up to 15 credits of graduate level courses to replace undergraduate classes for the undergraduate degree. The 15 credits will also count toward the MS degree.